Renault-Nissan-Mitsubishi and Google announced a technology partnership to embed the Android operating system in vehicles sold by the world’s leading automotive alliance, providing intelligent infotainment and customer “focused-applications” across multiple models and brands, scheduled to start in 2021. Under the technology partnership, vehicles sold by the Alliance members in many markets will utilize Android, the world’s most popular operating system, and will provide turn-by-turn navigation with Google Maps, access to a rich ecosystem of automotive apps on Google Play Store and have the ability to answer calls and texts, control media, find information, and manage vehicle functions with voice using the built in Google Assistant. The infotainment partnership forms part of Alliance moves to equip more vehicles with connectivity and cloud-based services as part of its Alliance 2022 “mid-term” plan. Today’s announcement, coinciding with the first anniversary of the mid-term plan, symbolizes the Alliance focus on next-generation technology. Under the plan, Renault-Nissan-Mitsubishi is targeting increased sales of more than 14 million units a year by the end of 2022. 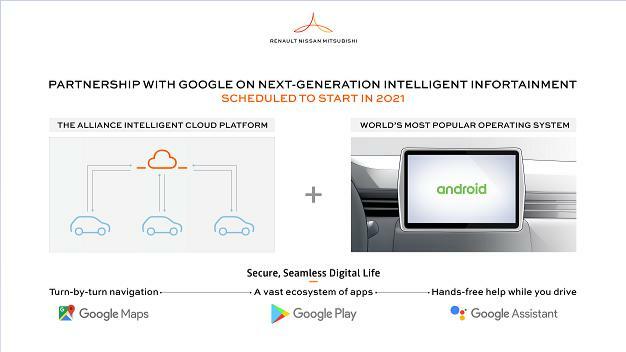 Hiroshi Lockheimer, Senior vice president of Platforms & Ecosystems at Google, said, "Google and Renault-Nissan-Mitsubishi share a common vision of delivering an intelligent, safe and seamless in-car experience with apps and services that are familiar, upgradable and connected. We’re thrilled to partner with Renault-Nissan-Mitsubishi to bring Google Assistant, Google Maps, and other popular apps via the Play Store and Android to drivers and passengers around the world."